What newcomers to this city often forget is to validate their ticket for public transport. You will have to pay a heavy fine if you forget and don´t speculate on getting away with it. There are many, many ticket inspectors in Berlin who conduct random checks. 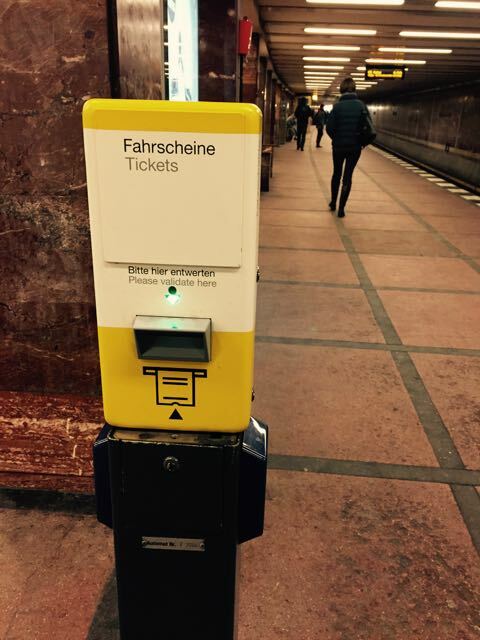 In order to use the Berlin public transportation system, you will have to buy a ticket; in most cases you do this at a machine. These you can find in the U- and S-Bahn stations. You can get tickets for different time length, from one way, to one day, to one month. What most people who are not familiar with the Berlin transportation system do not realize is that they have to validate their ticket after they buy it. You do this by inserting the ticket in the red metal boxes that stand close by. Only these red boxes stamp the time and date on the ticket. If you do not stamp your ticket it is not validated and you are not allowed to use the trains. With your ticket you can use all different means of public transportation in Berlin. If you are getting on a bus however and you do not have a ticket yet, you will have to buy it with the driver. These tickets do not have to be stamped. Bus tickets are already validated when handed out. So if you are getting your ticket at a machine, don´t forget to validate your ticket in order to avoid being fined. The excuse that you did not know this will not help you with the ticket inspectors.